Hello Lance, thank you for your question. 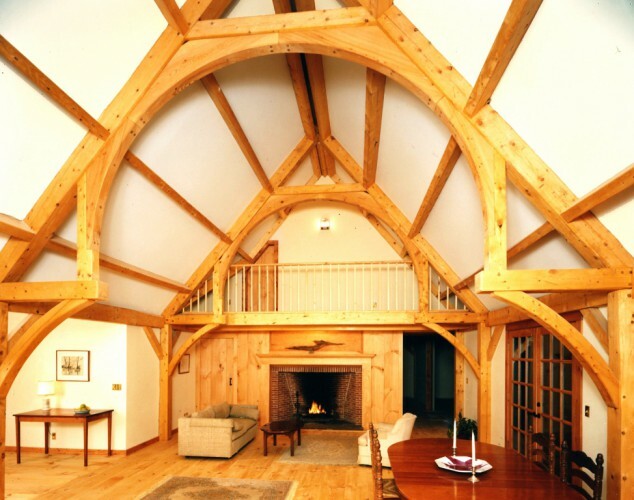 A 40′ span with a hammer-beam truss is certainly a possibility. There are a lot of variables that can sway my answer in either the yes or no direction, especially the geography of the site (snow loads? ), the tributary width each truss is supporting, and the species of timber used. Hammer-beam trusses tend to have significant lateral forces pushing outwards along the bottom, which is why medieval churches have such large buttressing elements on their exteriors. This problem requires buttressing within the structure itself, or a steel tie across the bottom of the truss that can take the tension load. The 40′ span is much more plausible if the steel tie is an option. Unfortunately, I cannot give you a definitive yes or no to your question as there are so many variables. If you would like to learn more, please contact our sales department at (802)-886-1917 and they can talk through your design and help answer some of those questions. We’d like to answer your question, but we’re not sure what you’re asking about. What exactly are you asking the size of?